In the heart of the city of Cortona, in a very quiet position, the apartment enjoys all the best facilities available to give its hosts the perfect holiday. 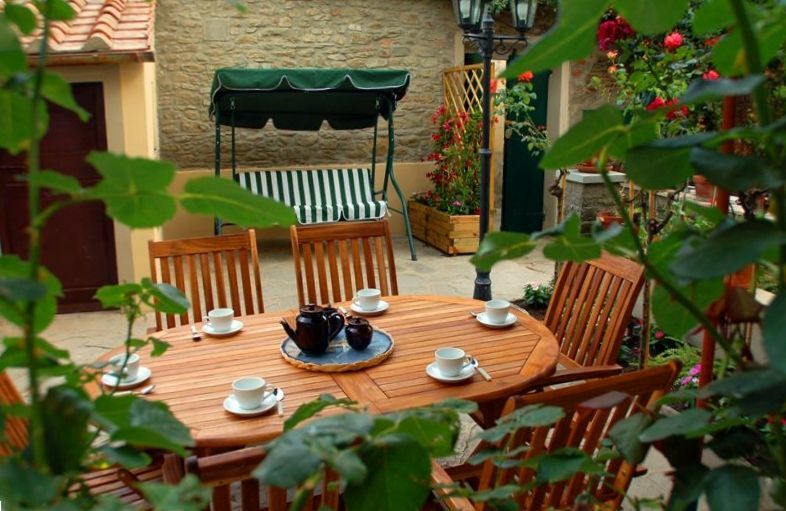 A large and beautiful garden of 100 square meters, equipped with table, chairs and a Barbecue ... make it a dream corner in the city of Cortona. The apartment has been completely renewed in Jun 2010, and refurnished with extreme care of details. Apartment/ flat 6 - 8 persons. Bedding : 2 Double bed, 1 Sofa bed, 1 Bunk bed(s) (2 places). Baby-sitters available, E-mail reception, Dial-up internet access, Airport transport upon demand. Altitude 600 m / 1710 ft. Historical site : less than 50 m.
Cortona : less than 50 m.
By Car: From A1 (either north- or southbound) take the Valdichiana exit. After you pay your toll, turn to the right. At 0.5 km from the tollbooth take the Perugia Superstrada (direction Perugia). Continue on it for 12.3 km to the Cortona/Camucia exit (don't take the earlier exit unless you want to stop by Farneta). In just under 3 km you'll see Cortona on the hill. Follow the signs to Cortona; about 7 km further you'll be at the city walls. • SPECIAL WINE TASTING IN EXCLUSIVE LOCATIONS AT A VERY SPECIAL PRICE! Where to eat: Osteria del Teatro, Pane e Vino, Trattoria Toscana, Trattoria Dardano, Antica Trattoria, Locanda del Loggiato, the Hosteria Bucaccia, Restaurant Tonino. What to do: For requests of transfers, excursions and guided tours please contact our friends of Across Tuscany Tour Operator. Upon arriving we were greeted by the owner's son and wife and escorted through the narrow cobblestone streets of Cortona to our new home for the week. The green door in the wall gave no indication of the quaint courtyard and substantial house that awaited us. This had been the owner’s family home and it was evident by the sturdy furniture and fully stocked cabinets. Everything you needed to make your stay comfortable was supplied. It was more spacious than we envisioned and the location couldn’t have been more ideal. The main piazza was a short stroll away but far enough to make for a peaceful evening. The owners were warm and welcoming and always a phone call away. We had locked ourselves out one evening and a relative happily came to our rescue. Our departure date fell onto a holiday and after returning our car the day before we realized bus service wasn’t running on the holiday. The same relative happily picked us up at the crack of dawn to give us a lift to the train station. We have already recommended Il Roseto to friends and would love to stay again when we return to Italy. My husband and I stayed at Il Roseto for 16 nights. Fernando's son, Pierfrancesco met us at the train station and we followed him to Il Roseto. This family home is inside the beautiful hilltown of Cortona. Pierfrancesco was very helpful and very friendly. This home was clean and spacious and had everything we needed and had a bottle of wine and fresh fruit on the table to welcome us. We loved the outdoor garden patio and often enjoyed lunch or dinner outside. The apartment is just a minutes from the piazza. We walked into town several times a day visiting many shops and restaurants. We started most days with cappuccino at Caffe Bar Signorelli. We also enjoyed all the photography exhibits from: "Cortona on the Move" International Photography Festival. We walked up to the Medici Fortress, which had photography exhibits in gallery spaces on each floor. The MAEC Esruscan Academy Museum had a photography exhibit which included Pete Souza's collection of "Obama, An Intimate Portrait." This was our third visit to Tuscany. We had an amazing time and we hope to return. My husband and I and another couple stayed for one week. We were in Portugal and Italy for four weeks, and this was our favorite rental. Fernando and his son were very helpful. All communications received prompt responses, and the property was exactly as represented. I’m basically confirming all of the other very positive reviews. Outstanding! What a lovely apartment - in a great town! I have just recently finished renting this apartment - and it was absolutely wonderful! We found Il Roseto on VRBO and started to communicate with the owner. He was great - all emails were answered quickly, and questions were answered. The apartment was clean and ready for us when we arrived - with a bottle of wine and fresh fruit on the table to welcome us! That really was a nice extra touch. The apartment is a great place....all very comfortable - with three nice bedrooms and two great bathrooms. The owner also had the TV and Wifi working - which is great to have. The best part of the apartment, though, is the outside patio/garden! That truly made it ...sitting outside having coffee or drinks in the evening was so nice! Cortona is a great town to visit - and Il Roseto really is THE place to stay! Fernando, the owner, is very helpful and easy to contact if needed....and we loved our time at his place! Lovely home! Perfect location, super helpful owner! My dad and I stayed in Il Roseto for one week in early April. The home was wonderful…beautifully enclosed patio with outdoor seating, one formal dining room and living room with a comfortable couch. Bathrooms are updated, bedrooms have lots of closet space! The location couldn't have been better (but make sure to bring comfortable walking shoes - there are lot of steep hills in this town!) The center of the town is a quick 2 minute walk from the home where you can find a fully stocked and friendly staffed marketplace. There are multiple restaurants, cafe's and little shops in the city center. The train station is a short 10 minute bus ride. The bus system was very reliable and inexpensive (1.50 Euro, I believe). Plus! While you wait for your bus you have a beautiful view of the Tuscan landscape. Cortona and Il Roseto villa are not to be missed! Fernando and his son came to pick my father up at the train station and gave us a tour of the villa. He had even gotten us a few snacks and a delicious bottle of red wine! My father and I were very impressed and loved every minute of our stay! I look forward to returning to Il Roseto!! JUST PERFECT......TRULY A HOME AWAY FROM HOME !!! A girlfriend of mine and myself had a girls getaway and had the pleasure of staying 11 nights at this beautiful, spacious, and VERY clean home in Cortona ! We both can't say enough great things about this home.......the pictures are a reality of how it looks. We felt so comfortable and safe. Fernando, as well as his son, were the ultimate hosts. Fernando was always available via cell phone or email, he kept in touch on a regular basis making sure we were ok. The home is also within a few minutes walk to the main square, which was wonderful when we just wanted to go into town and have dinner and wine knowing it was a short walk back. We had rented a car, visited several of the other Tuscany towns and were always lucky to have found free parking close to the house. We definitely plan on returning and staying at this home again ! This is a not to be missed property........you will not be disappointed ! I'm sure you will love it as much as we did !! !